Need help keeping track of your assets? Used Trimble’s Tracker RFID System to track and location your equipment quickly and easily and in real-time. The Tracker RFID system uses RFID technology with Trimble® Asset Manager to provide you with the information you need, when you need it. With the Tracker RFID System you can locate equipment that needs to be shared between projects, monitor the owned versus rental status for each asset and inventory equipment quickly and easily. You’ll also know what assets are on site. At the corporate level, you can use the Tracker RFID system to monitor overall utilization while your project manager monitors site utilization. The Tracker RFID system allows you to scan assets multiple ways –fixed, handheld or vehicle. Plus, you are provided with a variety of RFID tags to suit your various needs. Tracker allows you to reduce work stoppages and time spent driving to the site to manually locate assets, as it comes Connected Site® ready. Tracker can accurately and automatically monitor asset movements, available and use as well with Connected Site. With Tracker, you are provided a complete, centralized view of all your assets on multiple sites. You can integrate, report and document asset location information and visual condition from your office using Trimble Asset Manager. The Tracker RFID System is composed of rugged RFID readers and tags as well as the smart Trimble Tracker and Trimble Asset manager software. Three RFID readers are included: the Trimble Site Mobile RFID handheld controller, the Trimble RVR500 RFID Vehicle reader and the Trimble RFR500 RFID Fixed Reader. The rugged Trimble Site Mobile RFID handheld controller can be used to commission new assets, scan RFID tags and wirelessly sync asset information between the office and job site using the Trimble Tracker field software. This versatile controller is also capable of running Trimble SCS900 Site Controller software. The Trimble RVR500 RFID vehicle reader is used on vehicles to scan RFID tags and is ideal for pickup trucks and service vehicles. The RVR500 RFID vehicle reader scans assets as the vehicle it is installed on drives through the construction site. The reader comes in a rugged case and requires minimal installation – simply attach the antennas to the side of the vehicle and insert the plug into the trailer power adapter. The Trimble RFID Fixed Reader is ideal for more permanent installations, such as gates, water trucks, fuel trucks and other service vehicles. The included RFID tags are available in many different sizes and shapes and can mounted on different materials, such as plastic, metal and concrete. The size of the tag indicates the range at which it can be detected. 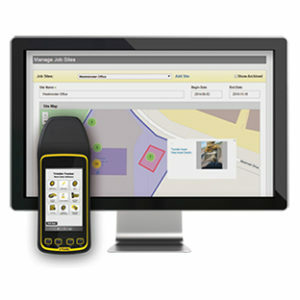 Trimble Tracker is the field software that runs on the Trimble Site Mobile RFID handheld controller and syncs with Trimble Asset manager back at the office. Trimble Asset Manager is a web-based office software database that stores your asset history and location. It can also display visual condition data when used with Trimble Inspector. Asset Manager does require a Connected Community subscription.